Pour a bit of water on the counter. 1/4 cup should be enough. Note the time that you placed the water on the counter and time the water to see how long it takes to absorb (the granite will darken). Immediate absorption: Apply a couple layers of sealer annually and wipe spills quickly. 4-5 minutes: Multiple layers of sealer needed, but only redo every 3-5 years. Use this water test again before reapplying. 10 minutes: Apply a single layer of sealer; may be many years before reapplication is needed. 30 minutes (or doesn’t absorb): No need for sealer! 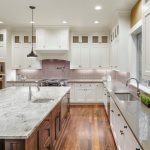 If you only have to seal your granite countertops once in a while and you love the look of granite, go for it! Come see us at The Granite Guy, serving the Columbus/Worthington, Ohio area, to fall in love with granite. We are locally owned and operated and are committed to serving you! My wife has been asking to have granite countertops put in for years. We are finally at a point that feels like we can afford it, so we are going to pull the trigger. 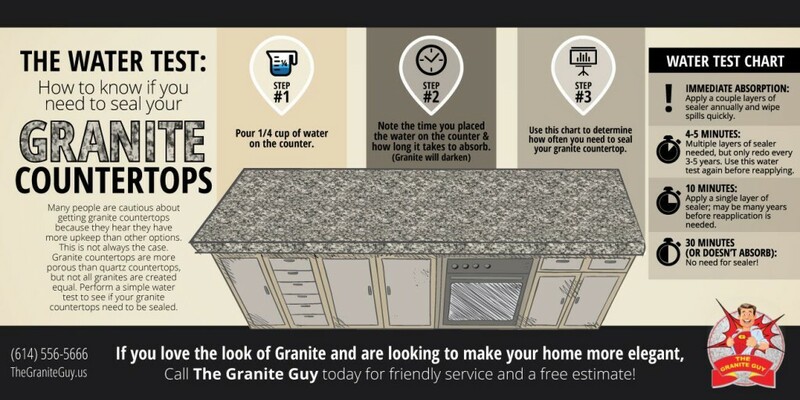 I didn’t realize that certain granite needed to be sealed to prevent water damage, as opposed to a quartz countertop. I will have to make sure I get some that won’t need extra sealing. Should the sealer make the granite look dull or polished? Looks like it sealed based on water test, but is not shiny.